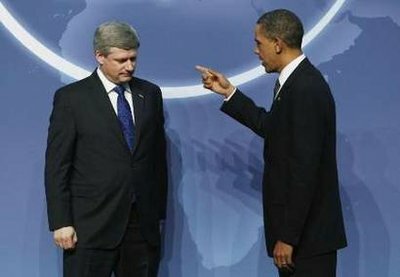 I absolutely love this photograph, taken when Barack Obama told Stephen Harper a thing or two, after Stephen insisted that he really enjoyed the Bush/Cheney years and was sorry that they had come to an end. Before Barack chewed him out, Stephen also was trying to convince Barack that the neo-con, right wing policies Stephen was trying to implement were a good thing and that Canadians actually support him, which is of course, totally untrue. This is too funny. Where did you get it?